The ES uses an open file format known as PO to handle internationalizing. You may add new PO files to add support for new languages. Currently we support English, French and Norwegian. It would be great to have more languages. If you know a language it would be great if you could translate the PO file as described below and send it to us by email. If you don’t have an ES we can do the testing. 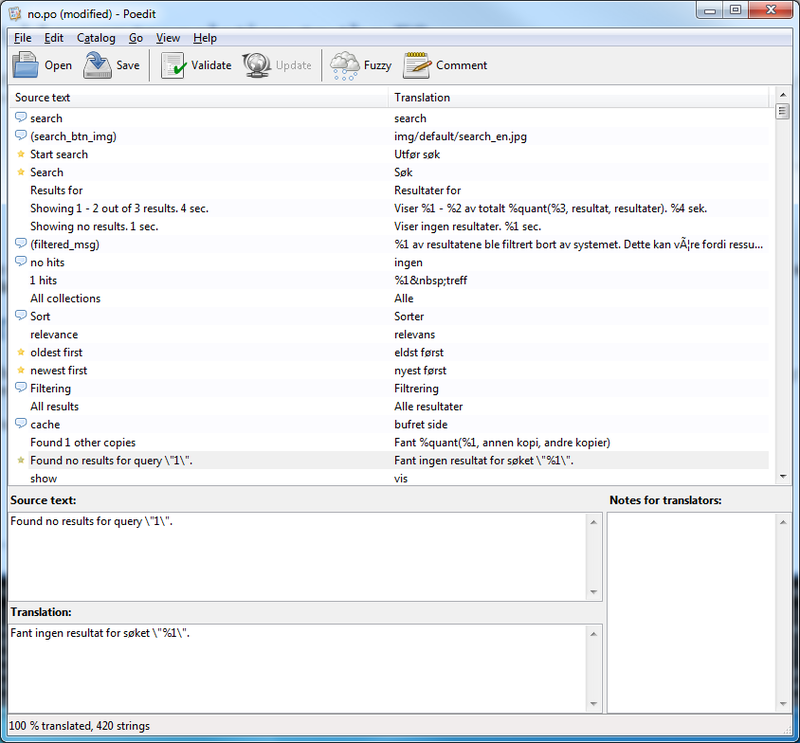 Use a PO editor or a normal text editor to edit the PO file. We recommend the free and cross-platform PO editor Poedit. Create a new directory that has the same name as the ISO 639-1 language code for your language (see her for a list of ISO 639-1 language codes). It would be great if we also could have the file! If you want to share it, sent it to us and we will add it to the main distribution. The ES uses the language set as default keyboard language when determining with language to use when rendering the search result page. If you want to test different language you can add a language parameter to webclient. Translating to Norwegian using Poedit.